School of Living’s Education Committee serves to share information and experiences that support the development of just and sustainable communities. Our quarterly meeting was conducted electronically on January 20, 2018 to avoid winter traveling. The education committee put together an hour-long skillshare which was compatible with our conference call platform (Zoom). The concept was that each presenter would have about 10 minutes to share: something that they were passionate about, insights, specific strategies that were working for them on their homestead or in their communities, recent conferences or workshops, DIY’s, etc. Karen from Heathcote Community started us off with a review of her recent participation in Dave Jacke’s Food Forest intensive. Through the study of how forests work in nature, she learned how to design a productive forest (producing “food, fuel, fiber, fodder, fertilizer, ‘farmaceuticals’ and fun”). She shared how a deeper understanding of forest succession and levels of permanence can inform design. Karen came away from the intensive excited about the design projects others were working on. She made new connections that she felt could lead to future partnerships. 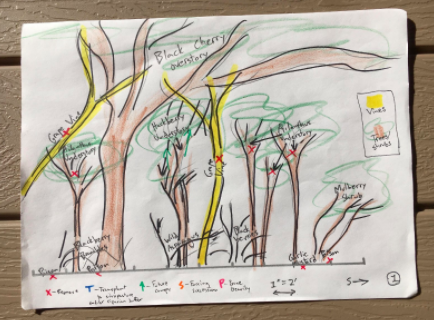 Her inspiration became really clear as she shared the vision she had to establish a full design and, more specifically, install a multi-use riparian food forest for Heathcote Community in Maryland. Karen put together some images of her experience to share. Here it is in a PDF format and, here, the slideshow version can be accessed through google drive. Deborah from Julian Woods Community has been working with her community to create an arts and healing center, called Turtle Way. She shared the creative process that is moving them forward and sustaining their passion. 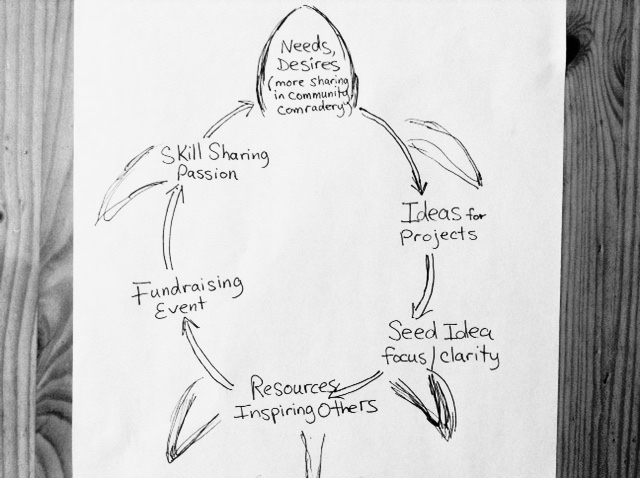 Deborah used this fun graphic to clearly communicate the ideas and movement behind what can be a complex process. Brenda is passionate about the tiny house movement and has started working on her own design for a tiny house. 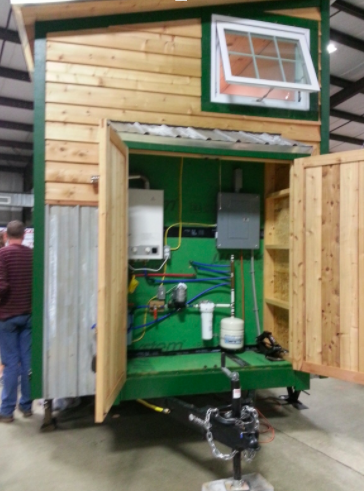 She recently attended a tiny house expo. She sees good potential for young adults as well as seniors adopting this lifestyle and architecture. She spoke about how tiny houses could play a part in our land trust communities and, importantly, she gave consideration to zoning regulations which can be challenging to building and using a tiny house. She references the National Organization of Alternative Housing (NOAH) as being a, particularly, useful resource. Here are links to two powerpoints: The first powerpoint shares resources regarding certification, building, location, and uses. The second powerpoint shares images from the expo that inspired Brenda. Taylor introduced the “Blueprint of We” which is a collaboration document that people in a relationship or in an organization can create and adapt. The tool was developed by the The Center for Collaborative Awareness. He felt that School of Living would benefit a great deal in creating its own Blueprint of We. The process of creating this document starts with learning, through specific questions, about the individuals that make up the organization. In this way, the organization can gain clarity in how it can, collaboratively and strategically, move forward. The resulting document can be used in getting to know new members and they, School of Living. It would, also, help us in developing partnerships outside of our own organization. We look forward to working with Taylor during our membership gathering in April to create our Blueprint of We. 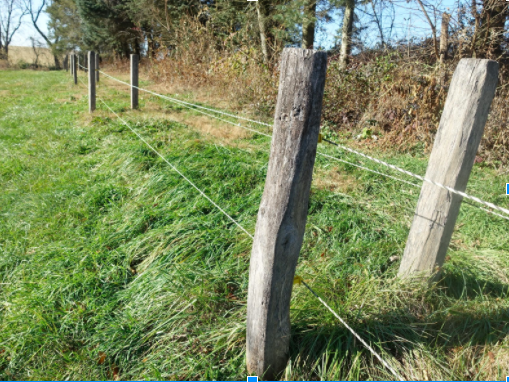 Michaelann from StellaLou, quickly, shared a “How-to” for building a 3-d electric deer fence. This was a successful strategy for keeping deer from damaging their new orchard. Here is a link to that information. We will be posting our School of Living Newsletters in our blog. They will be archived in the Publications menu. We hope you will enjoy and share! Please consider making a donation to School of Living. A one-year membership is offered with every donation.